It's conceptual possible, if not always practically convenient, to separate tax policy into two main pieces. One issue is the tax cut vs. tax hike debate--that is, whether the total amount being collected should be higher or lower. The other issue is whether the tax code should be adjusted in some way to alter its incentives and disincentives. As one example, the 1986 Tax Reform Act was more-or-less neutral in the amount of revenue it collected, but it altered the incentives of the tax code by combining lower marginal tax rates with a reduction in the availability of various deductions, credits, and exemptions. its 50-year average of 20.3%, while the level of total federal taxes is pretty much right on its historical federal average of 17.4%. Thus, the budget deficit at present is also very close to its long-run average of 2.9% of GDP. When looking at a government's debt burden over time, the most useful quick metric is the ratio of total accumulated debt/GDP. Here's a CBO figure from March 2017 showing this metric for the US economy over time--and projections for the next couple of decades. 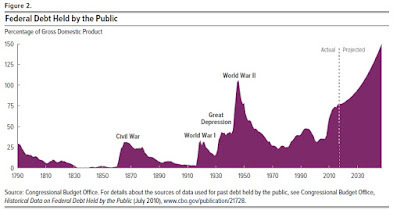 The common pattern over time is that the debt/GDP ratio rises sharply during wartime, and around times of extreme economic stress like the Great Depression of the 1930s and the more recent Great Recession. But the Great Recession ended back in June 2009, and the US unemployment rate has been 5% or lower for more than two years, since September 2015. Moreover, the long-term projections from CBO suggest that existing government programs are going to exert very large pressures for higher government debt in the next couple of decades, as the boomer generation retires and health care costs continue to rise. When (and not if) the next recession arrives, it will be a good time to run larger deficits again. But the case for a tax cut to stimulate the US economy that reported a 4.1% unemployment rate in October 2017 is weak. What about the effects of the tax bill on economic incentives? I sometimes use the analogy that economies carrying a tax burden are similar to a hiker carrying gear for a back-country excursion. If the hiker has a well-fitted and well-padded backpack, with the weight nicely distributed, it's a lot easier to hike all day. If you took the exact same camping gear and randomly attached it to hiker around their body--some on the feet, the heaviest weight on the right arm and nothing on the left arm--that same amount of weight becomes very difficult to carry. Thus, the question of tax reform is not whether the burden should be higher or lower, but rather how best to distribute a given amount of weight. There are of course lots of estimates of how the tax bill will affect incentives, but the estimates of the Joint Committee on Taxation are especially worthy of notice. Because Republicans control Congress, that party also controls the Joint Committee on Taxation. However, many staff members of the JCT soldier on from one administration to the next, showing both some willingness to be flexible as their political guidance changes, but also showing some stubbornness in insisting on a certain level of consistency and logic in their estimates. Thus, economists who tend to align with the Democratic party like Larry Summers, Jason Furman, and Paul Krugman have all been willing to cite the JCT estimates as a reasonable basis for discussion (although I'm sure they also disagree with these estimates in various ways). We estimate that this proposal would increase the level of output (as measured by Gross Domestic Product) by about 0.8 percent on average over the 10- year budget window. That increase in income would increase revenues, relative to the conventional estimate of a loss of $1,414 billion ... by $458 billion over that period. This budget effect would be partially offset by an increase in interest payments on the Federal debt of about $50 billion over the budget period. We expect that both an increase in GDP and resulting additional revenues would continue in the second decade after enactment, although at a lower level, as many of the provisions that are expected to increase GDP within the budget window expire before the second decade. "The bill changes individual income tax rates, lowering the top individual income tax rate from 39.6 percent to 38.5 percent, creating an additional individual income tax rate bracket, and lowering statutory tax rates for most tax rate brackets, while changing the measure used to adjust the brackets for inflation from the present law consumer price index (“CPI-U”) to the chained consumer price index (“chained CPI”). The chained CPI grows more slowly than the CPI-U, thus resulting in people over time moving into higher rate brackets at a faster rate under the bill than under present law. The bill also reduces individual shared responsibility payments for failure to obtain qualified health insurance coverage enacted as part of the affordable care act to zero. At the same time, the proposal eliminates a number of deductions and credits from their individual taxable income while increasing others. The biggest changes include eliminating personal exemptions while increasing the standard deduction, and increasing the maximum amount of the child tax credit while increasing the income range over which individuals may claim it." Thus, while the bill does reduce taxes at high income levels, that doesn't seem to me the main thrust of the bill. The cost of the dramatic rise in the standard deduction and to a lesser extent in the child tax credit is very high. To me, one of the most interesting dimensions of this change is that with a much higher standard deduction, many fewer taxpayers would find it worthwhile to itemize deductions. Thus, if or when proposals resurface a few years from now to reduce popular deductions like the one for home mortgage interest or state and local taxes, many fewer people will be using those deductions, and the political calculus around them may shift. "The Framework would eliminate dozens of different tax expenditures and fundamentally reform the business tax base to reduce distortions that hurt productivity and growth. It would reinvest these savings to lower the corporate tax rate to 28 percent, putting the United States in line with major competitor countries and encouraging greater investment in America. ... Our tax system should not give companies an incentive to locate production overseas or engage in accounting games to shift profits abroad, eroding the U.S. tax base." "In addition, the bill lowers the corporate income tax rate from 35 percent to 20 percent beginning in 2019; and, it increases the rate of bonus depreciation to 100 percent while extending it for five years, from 2018 through 2022. The bill also repeals or limits deductions for a number of business expenses, the largest of which is a 30 percent limit on interest deductibility. Finally, the bill makes significant changes to the taxation of both foreign and domestically controlled multinational entities. It would allow domestic corporations to receive a dividend from their foreign subsidiaries without incurring United States tax on the income. It also creates a new minimum tax for certain related party transactions in order to reduce the erosion of the United States corporate income tax base. In a further effort to reduce base erosion, it equalizes the tax treatment of specified high return income from foreign sales whether they are earned through a foreign corporation or a domestic corporation." There are clear differences between the plans, of course. The Obama administration was talking about cutting the corporate tax rate to 28%, not 20%. In addition, the Obama plan emphasized that changes to corporate taxes should be revenue-neutral. But on other other side, the Obama proposal is a white paper, not actual legislation, which means that it had not been put through the Congressional meat-grinder where seemingly every legislator is demanding a sweet tidbit of their own devising in exchange for supporting the bill. Assuming this tax bill moves forward and becomes law in essentially its current form, one of the most interesting aspects to keep track of will be its effect on investment. There is a widespread fear that ongoing low levels of investment are slowing US economic growth, both in the short-run and the long-term. A common solution proposed by Democratic-leaning economists has been to support a high level of infrastructure spending, and before President Trump was elected, it was common to hear arguments pointing out that if an infrastructure investment could be financed at today's low interest rates, and if that infrastructure investment brought a long-term payoff, it would be economically sensible to undertake the project even if it increased short-run budget deficits. In effect, the current Republican tax bill repurposes that argument into a claim that if certain tax changes call forth sufficient private sector investment, then it is worth increased budget deficits as well. This already overlong blog post isn't the place to try to sort through the merits of public-sector and private-sector investment, and whether the kind of politically-driven infrastructure spending on roads and bridges that typically bubbles up through Congress is the most productive way to build a strong base for the US economy in the 21st century. I think it might be even more useful to consider an infrastructure agenda applying to energy resources and to data networks, and for hardening this infrastructure against physical- and cyber-attack. But focusing just on the Republican tax plan, the additional budget deficits seem certain to be very high and the promised investment benefits seem relatively small and uncertain.